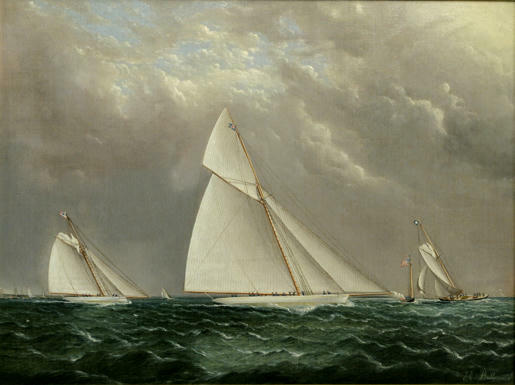 A dynamic commission by the premier American artist of racing yachts, James E. Buttersworth, this narrative portrait captures the racing sloop MAYFLOWER, fresh off her America’s Cup victory the previous year, in competition for the Goelet Cup on August 5, 1887. Shown as the committee ship starting gun is fired, the Sloop VOLUNTEER has the early lead, and the plum-bow cutter Huron is on MAYFLOWER’s port quarter. The Goelet Cup, raced for by schooners and sloops of the New York Yacht Club and the Eastern Yacht Club, was a highlight of the cruise season. VOLUNTEER would hold her thin lead to win the trophy. Flying personal signal pennants for individual glory, the Boston-built MAYFLOWER was owned by General Charles J. Paine, and arose from the designs of Edward “Ned” Burgess, built entirely of oak and hard pine in a day when steel hulls, such as VOLUNTEER’s, were on the rise. Buttersworth appears to have been on the water with a crowd reported to thickly line the course, to see if the new sloop could best the America’s Cup champion, and undoubtedly painted other commissions at this same event. Interestingly enough, both MAYFLOWER and VOLUNTEER would be converted to schooner rigs within two years. Trailed by N.Y.Y.C. Rear Commodore William Butler Duncan Jr’s HURON, a fast but smaller sloop that competed for years after her 1883 launch, the 1887 Goelet Cup is probably the only event to feature all three yachts as sloops. Buttersworth’s ocean has complex rhythmic flow to its shape and movement, seen most often in his paintings of the late 1870s-80s. The horizon holds many other racers, and the profile of a large steam yacht, most probably N.Y.Y.C.’s ELECTRA, the committee ship for the cruising season. Above, a heavy gray sky is broken with the illuminating glow of Buttersworth’s light qualities, with fingers of sunlight cast throughout. Born in 1817 in Middlesex County, Great Britain, James Edward was the son of important English sea painter Thomas Buttersworth. Settling in New York in 1845, he soon established himself as one of America's leading marine artists. During the next period of his life, many of his works were chosen by Currier & Ives as subjects for lithographs. His images were also used in magazines and newspapers that reported the yachting events of the day. New York Harbor and the surrounding areas became a favorite background for his vessels which he portrayed faithfully with an eye for precise detail. His reputation sprang from his accurate representations of the great sailing yachts of his time. In order to accent the speed and grace of these vessels, he would often elongate the hulls and sails to create a feeling of motion portrayed along a low horizon line. With dramatic skies, churning seas and accurate detail, he ennobled and romanticized sailing ships with what have become historically important paintings that are both beautiful and refined.